In the Ryerson University full-time MBA program at Ted Rogers School of Management, students gain an inclusive business management education that incorporates academic theory with practical and research-based learning styles. The Ryerson University full-time MBA in the Management of Technology and Innovation (MBA-MTI) program provides graduates with skills in problem-solving, critical thinking, communication, and collaboration. This is not a technical program—students of the MBA-MTI program graduate with the skills needed to manage within companies that are focused on tech and innovation. The accelerated Ryerson MBA program can be completed in 12 months. If a student does not have an academic background in business they will be required to complete a set of Foundation Courses that can be completed in one semester. For every course a student is enrolled in they will be in class for three hours per week. In order to be successful, students should plan on devoting a minimum of 8-10 hours per week outside of the classroom for each course. The full-time course load is three to five courses per semester. Students are able to switch from full-time to part-time and vice-versa. These decisions will be discussed on a case-by-case basis with the Program Director. Students in both MBA programs will take core classes as well as electives in an area of interest. Students will take part in class-based learning as well as practical, hands-on experiences. The Global MBA emphasizes the skills needed to work within a global market and to become a leader and innovator on a global scale. Technology MBA students will learn the skills needed to become a leader within the tech industry from a business perspective. MBA Global students have the option to specialize in any of the following areas: Human Resources Management, International Business, Marketing, and Real Estate. Or they can choose to do a general specialization by selecting electives from different specializations, including: Strategy in International Business Environment, World Logistics and Supply-Chain Management, Advanced International Marketing, Regulation Government and Social Responsibility Management, and more. Students may also choose to do specializations for the MBA Management of Technology and Innovation (MTI) program in areas such as Information Systems Management, Media Management, Supply Chain Management, Business Analytics, Data Security, or Entrepreneurship. 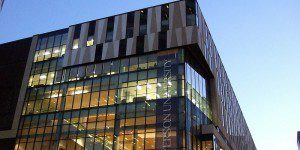 The Ryerson University full-time MBA has a yearly enrollment of about 125 students, with an average work experience of five to seven years. The average MBA student age is 29, and the student body is approximately 60 percent male and 40 percent female. A GMAT score of 550 is the minimum to apply, though the average for the recent class was 628. International students are invited to apply, but must study on a full-time basis. Ryerson University full-time MBA graduates typically find employment quickly, their earning potential is strong, and their salary increase post-graduation is higher than average. The school averages a 90 percent internship-placement rate, most of which lead to full-time employment. Approximately 90 percent of MBA graduates are employed six months after graduation in full-time roles across a diverse group of industries. For the upcoming school year, the Ryerson University full-time MBA degree tuition for domestic students was $21,265.31 (plus additional fees) for 13 credits (11 courses), and $34,113.20 for international students. Students are charged tuition per course. Foundation courses are required for students without a BComm or equivalent undergraduate degree. The number of Foundation courses required is based on an official assessment of the appropriate transcripts upon application. Each foundation course would cost the student the equivalent of one credit; $1,933.21 per course for domestic, and $3,101.2 per course for international students. There are a number of Ryerson scholarships as well as graduate-assistant and research-assistant positions available to full-time students who meet specific criteria. Thanks to a $15 million donation from Ted and Loretta Rogers, 24 graduate scholarships and awards (worth $20,000 each) will be available to full-time students applying for the coming academic year. International students are also eligible for these scholarships. Additionally, the Ontario Government has a student-loan program called the Ontario Student Assistance Program, or OSAP. This program is independent of the school and requires an application. All applications for the graduate programs at Ryerson University are done online through the Yeates Graduate Studies page. It takes about one hour to complete the online application. The fee is $150, and will be required before the application is processed. Completion of a four-year bachelor degree from a recognized institution is required. Foundation courses will be required if this degree is not in Business Administration or Commerce. To apply to the Ryerson University full-time MBA program, applicants must submit a current résumé, two letters of recommendation, and a 500-word statement of interest. Applicants should have a minimum B average in the final two years of university study, and a GMAT score between 550 and 740. An English-proficiency score is required from all applicants who have degrees from institutions in which English is not the language of instruction or examination. After an application is submitted, the applicant will be asked to take part in a video interview. The Ted Rogers School of Business Management’s International Exchange Program provides an opportunity for students from across the globe to gain experience at a trusted Canadian educational institution. Incoming international students can get program-specific information directly from individual schools, as well as more general information about international programs at Ryerson directly from Ryerson International.